Oh, I've been gone so long. A family crisis came along that knocked me over and out. Things are now happily resolved, and I'm grandmother to eight-week old Rose Katherine who was born five weeks pre-term on September 9. She is doing very well, as is her mother. I have continued to knit during this period, but less than usual, without the love. 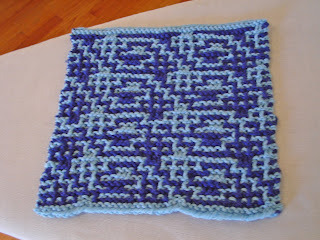 What kept me going in knitting and in life was the Learn to Knit Afghan. I am so glad that I took up this project. Each square is a little escape with a payoff at the end: a tiny finished project. Another bonus is that each square is a big swatch, so I have experienced many pattern stitches that I would never have had the patience to practice on my own. I would never make an eight inch swatch, but you really get a sense of the stitch when you do. I got through the mosaic section of the book; above is the seventh of eight mosaic squares, and below is the eighth. Now I must say that I have mixed feelings about mosaic stitch. On the one hand you can get some very clever and complex results from the easy use of just one color at a time. On the other hand, it seems like cheating - it's too easy - and it can look a bit cheap. I know that Barbara Walker is the mosaic queen, but I wish she hadn't included so many mosaic stitches in her book, especially since she lays on slip stitch patterns pretty hard. The next section of her book is all slips. 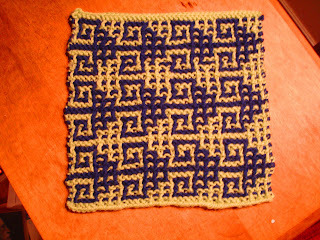 I know, I don't have to knit all of the squares, but I want to. Now I doubt that I'll knit this sweater, but I find it amazing and inspiring. The yarn is 100% silk and the mosaics give the slippery yarn body and stability. It is a great illustration of using mosaics that has stuck with me and will possibly lead to a future knitting adventure. This is the one year anniversary of my blog, but it probably doesn't count since I missed two months. So it is only the ten month anniversary. After being away for so long I wasn't sure that I wanted to come back. But I have enjoyed posting this, so I hope to continue. For a while I've been thinking about doing some sewing, so I might also post about that if I do any. I have been cooling a little toward knitting. Part of it is, being product oriented, I don't really want any more knitted objects and I don't think other people want many either. But I'll still always have at least one project on the needles. Currently I have four, counting the Learn to Knit Afghan. That may be too many. Welcome back and congrats on the 1 year blogaversary! It counts even if you didn't post because it's still here for people to read. Congrats on the grandbaby too. I've missed you. Happy Anniversary! Welcome back! I've missed you. And congrats, Grandma!